What sets Magnifique apart from others is the partnership with International hair, beauty and skin care brands like Lancôme, Thalgo, Cuccio, Kérastase and many more. The design architecture of luxurious boutique salon- Magnifique was by Aditya Bhandari and Mayank Manchanda from Centroid Gurgaon. The duo designed it to offer extraordinary luxury and without over the top elements. “We have made a number of salons and spas in the past but this one was a completely different experience because here we were trying to create something extraordinary without any over the top elements. We have carefully curated each concept inside Magnifique keeping in mind the target consumer of the space which is very niche and private. 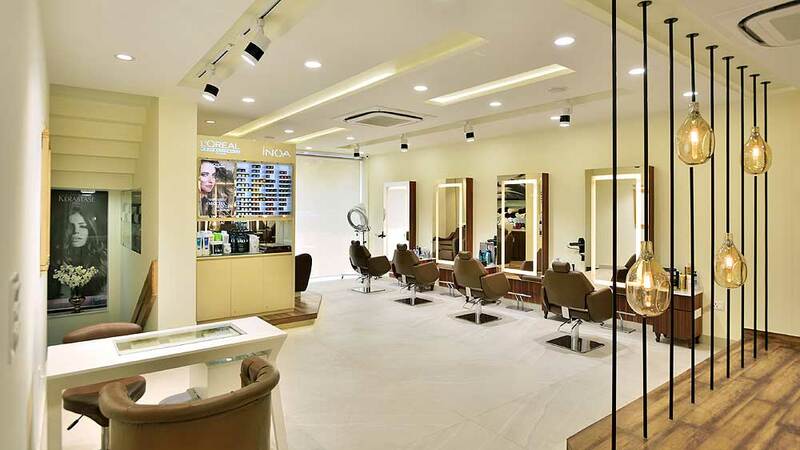 The salon has been designed in a fashion where one can choose their level of privacy,” said the architect duo, Aditya and Mayank from Centrioid Gurgaon. The beauty of this place is in its simplicity, a plain cream leather sofa with chesterfield on the back at the reception, elevated shampoo stations with a contrasting rich wooden floor against the cream stone flooring elsewhere, the beautiful lantern partitions, bejewelled lower ceiling above the pedicure stations, the diamond pattern mirror ceiling at the reception and lounge downstairs and the grass panel effect in the exclusive VIP room are some of the highlights of this place. “This must be our first time when we haven’t used any black inside the salon and a palette of colors which is very soft on the eyes. We have been receiving generous compliments and rave reviews for Magnifique and we find it very encouraging,” added the duo designers. Spread in two floors with an area covering 3,800 sq ft, the cornerstone of our design was privacy for our clients, comfort and aesthetics. We wanted to break the monotony of black and white, the palette widely used in salons and worked with warmer shades of cream, brown and mustard gold, which are also the colours of luxury. There are subtle elements of beauty; our favorites being the cabbana style elevated pedicure stations and the beautiful lantern partitions on both the floors. Comfort being our primary objective, both for the customers as well as our employees we have handpicked the furniture appropriate for each service starting from electronically adjustable shampoo stations to cozy reflexology chairs. Our VIP room which is equipped to perform everything inside the beautiful room itself has the pedicure and steamer from none other than Belmont Takara. The elevated pedicure stations have plush chairs to sink into with a remote controlled massager inbuilt for ultimate relaxation. We have three therapy rooms, two reflexology stations, fourteen chairs and three pedicure stations in the salon. The ground floor is blessed with a lot of natural light in abundance which makes it very bright and alive. The basement has three tones of lighting for three different purposes, very warm for the make-up section, chandelier with concealed lighting on the ceiling for the lounge and white spotlight mixed with warm lights of the mirror for the hair section. The lights have been very carefully chosen post brainstorming with Jojo, Yatan, and our Interior designers. We are associated with Thalgo, Forrest Essentials, Kama, Kérastase, Clarins, L’Oréal and The Body Shop to name a few for skincare and hair. Chanel, Lancôme and MAC for make-up. Cuccio, Axapta and Chanel for hand and feet care. Magnifique has an exclusive partnership with the celebrity make-up artist Jojo by the virtue of which we have a very talented bunch of makeup artists who belong to his school and come with great experience .We are the only salon which offers grooming by the man who grooms the crème de la crème of the country Yatan Ahluwalia. There are a number of exclusive partnerships getting finalized that we are very excited about and would be in a position to speak about soon. Ruling the Textile Industry Via Franchising..
BBLUNT franchise: Creating army of The Best..